As a part of Cal Poly Pomona campus authority, Police Officers, Parking Officers, and CSOs do direct vehicle and pedestrian traffic-flow. You may see an Officer performing traffic control during peak business hours on campus, where traffic is heavier, and also during medical emergencies. Our goal in performing traffic-direction on-campus is to effectively and efficiently direct or redirect traffic when warranted. Cooperation from the campus community and visitors is much appreciated. In an instance when a person does not obey the directions of an Officer, a Judicial Affairs referral for a student, or University Police action is subject to occur. We welcome any feedback or questions, email us at parking@cpp.edu. Tired of wondering what the traffic will be like on the freeway on your commute to and from work? 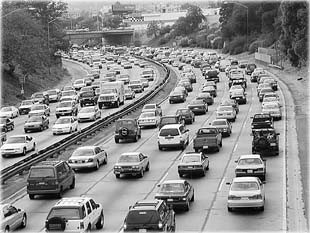 Try SigAlert.com and obtain real-time traffic updates for LA, Orange County, and Inland Empire freeways.